It snowed here a lot the other day. Although it was pretty cold I thought I’d go out and see the newly blooming umenohana or plum blossoms. Signs of Spring! The trees and flowers were covered in snow but, as always, were very picturesque. I added textures and filters on this image to replicate the cold and wind and sleet outside; the snowflakes were everywhere and I wanted the image to look like one seen through a frosty glass window on a snowy, windy day. 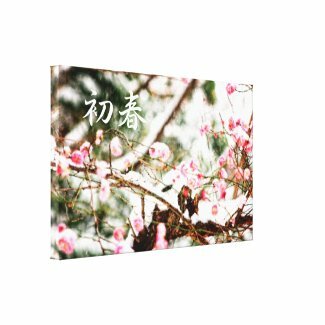 Customizable canvas prints are also available. The kanji (Chinese characters used in the Japanese language) I put on the left side reads as “shoshun” or “hatsuharu”, meaning Beginning of Spring, Early Spring, or New Year. Leave the field blank to remove this text, or replace with your favorite words or quotes. You just finished reading Plum Blossoms Covered in Snow. Please consider leaving a comment! This post is from the 3D viz and photography website, Beverly Claire Designs. If you are not currently reading this via designs.beverlyclaire.com, then this post may have been stolen or scraped from the Beverly Claire Designs site. Republishing this article in full or in part is a violation of Copyright Law (c)2010-2014, All rights reserved.